“Massage must be such hard work! How do you do it all day?” Meh, it’s not so hard. You can’t tell this when you’re on the table, but we don’t do much repetitive movement, and we get to switch things up if we get tired. In fact, it gets easier as you get more experienced. Know what’s hard? Riding a desk all day. A really long commute. Making tiny movements with your wrist for hours at a time. Seriously, I get more shoulder, neck and arm pain sitting at my desk for 2 hours than I do massaging for 2 days. I know this to be true. Do you work in an office environment, or in retail? You have a harder job than I do. The human body can adapt beautifully to a wide range of circumstances, including prolonged standing, constant micro-movements, or swinging a blacksmith’s hammer a thousand times a day. It will make some changes to accommodate your behavior, but it will rarely just refuse to do something, no matter how crazy it might be. 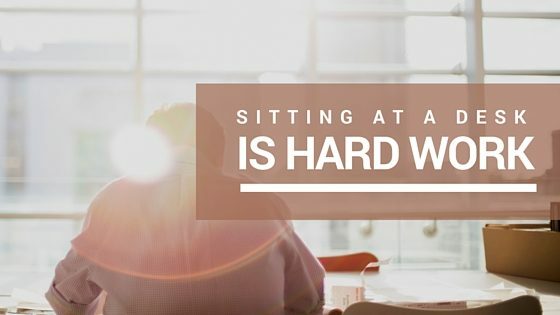 Sitting for 10 hours at a time is new for us humans, and yet we can do it. There are health detriments, but the body chugs along. Just realize that, even if you’re sitting still, your body is having to make a lot of compromises. Your metabolism slows to help you remain sedentary; your adrenal glands give you a constant low dose of stress to keep you awake and aware; and your muscles shorten to stabilize your neck, your shoulders, and your back. Your body’s trying to help you out, but it often ends up making you a stressed ball of tight muscle. Realize the difficulty of what you do for a living. You’re likely to get sick more, have more headaches, and have lower mood than you would if you moved more at your job. Make allowances accordingly. Take more breaks, get more fresh air, and treat yourself well. You deserve it, and so does your body!